Helloooo! Is there anybody out there? I am back from a long hiatus! I moved jobs and it has taken a bit for the dust to settle. I apologize for my super long absence from blogging. I will try to not let it happen again. I changed jobs in the absolute middle of Summer Reading so things were a bit crazy. I am not sure I would ever recommend doing this… I guess there’s no harm in jumping in head first, eh? It’s all over now so I’ve been able to get my head on straight and have finally been able to sit down after a few weeks of running around totally crazy. So, things have changed for me storytime-wise. I am now doing four storytimes a week, three of them are local preschools/daycares that come to the library and the other is an evening storytime for folks in the neighborhood. I am still going to plan one storytime per week and just run it three four separate times. So, when I discuss it in the blog, I will tell you about the books and any extras that are necessary to discuss then I will tell you what the kids thought. The other HUGE difference is the preschools and daycares come for an HOUR so my storytimes are much, much longer. These groups are walking dozens of small children long distances so we are making it worth their while and having a long program for them. I know everyone has an opinion about appropriate length for storytime. I, myself think about 25-30 minutes is the sweet spot, but this is something out of my control. As a result these programs are very fingerplay, flannel board and movement heavy. I still read 3-4 books but that happens towards the beginning since the groups are generally less antsy at the beginning and can sit still then. After that we are getting up and moving a lot more. Working at a new library always brings new colleagues to learn from and this place is no exception. The person I work with most closely is a wealth of knowledge when it comes to fingerplays, so that’s been a huge help. Finally, the last thing that has changed is I am not doing any crafts – for the time being. My preschool/daycare groups are all much too large and we don’t really have the space supplies. There also aren’t quite enough adults around to help. Each group has at least 45 children so it’s a little intimidating. I do want to get a craft started with my nighttime group, because that is generally much smaller. Eventually, I do want to start doing some crafts with the larger groups because frankly speaking I think it would be helpful for them and also a great use of that hour. Hopefully I can get this started soon! It’s all a work in progress. Does anyone have any advice? I have been re-reading Storytime Katie’s blog entries because I know she is doing similar things. You will even notice she has inspired my first few weeks of planning on my own at this job. Storytime is back! This week was the beginning of our 6 week session. But sadly, I will only be doing three of those weeks. The weather was crummy this morning and I arrived to work with totally soaked pants. Needless to say, I was not in the best of moods but luckily my storytime crew turned that around really quickly. I had a very big bunch today so there was great energy in the room. Our theme today was picnics, a perfect summer theme. The first book we read was Picnic by Emily Arnold McCully. In this book, a family of mice are going on a picnic. On the way to the perfect spot, they lose the youngest member of their family. (Spoiler alert!) Luckily they are all reunited and have a lovely picnic. This is a very simple story and I had the children guess if they would find her. Almost everyone said yes- there’s always one who goes against the grain. The next book we read was The Best Picnic Ever by Clare Jarrett. 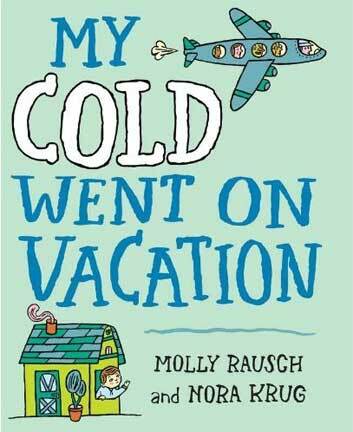 This is a great book about a boy named Jack who is going on a picnic with his mom. He has lots of adventures with animals before sitting down to the best picnic ever. It’s full of imagination and has lots of repetition. It’s a bit long, so make sure you group can handle longer-ish books. The last book we read was We’re Going on A Picnic by Pat Hutchins. In this book Hen, Duck and Goose are going on a picnic! They are a bit silly and can’t find the right place to have the picnic. There is a lot of silliness in this book and it’s fun to share with a group. 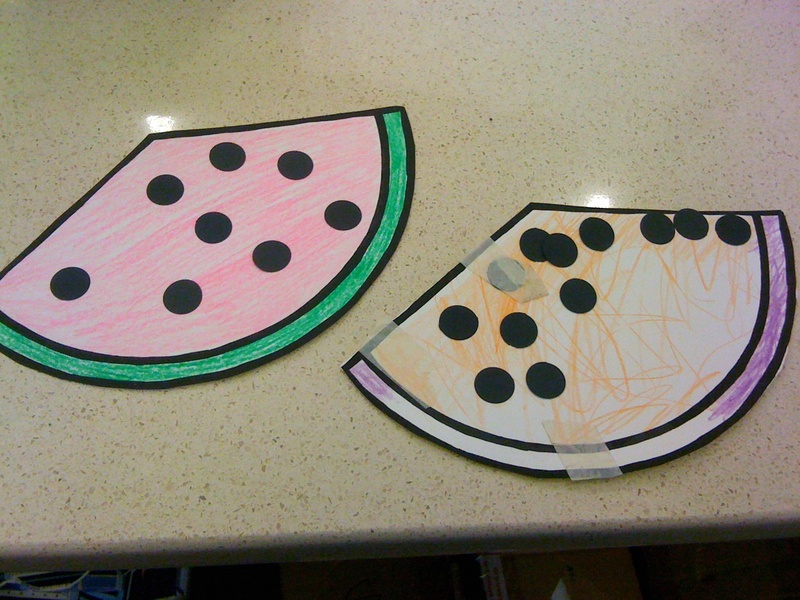 For our craft today, we made one of my favorite picnic foods: watermelons! Since it is summer and we have lots of teen volunteers, I had one cut out the shapes prior to the program. I gave them crayons and black circles to glue on as seeds. I told one of my little friends that his watermelon looked good enough to eat. He nicely reminded me “Miss Sarah, you can’t eat paper.” Silly librarian! Spring has sprung! The weather is absolutely beautiful and we celebrated today with a garden storytime! This is a lovely theme and is very versatile. I have been looking forward to this storytime for weeks and was so happy to finally share it with my kids. First we read My Garden by Kevin Henkes. This is a beautiful book about a girl who helps her mother in the garden and goes on to describe what her dream garden would look like. It’s full of imagination and encourages the children to dream about what their garden would look like. Next we read A Handful of Sunshine by Meanie Eclare. This book was a lovely addition to storytime today. It was a surprise find, I just stumbled upon it and am so glad I did. This is why I like it: it has real photos of a real girl planting sunflowers. That doesn’t happen too often with storytime books. Obviously there are lots of fantastic illustrations out there (Henkes’ from the first book are a glowing example) but it is nice to mix it up with something different. This book is a nonfiction and is easy to share with a group. Highly recommended! Also included this week was Planting a Rainbow by Lois Ehlert. This is a super versatile storytime book. It would be great in a colors theme and was perfect for gardens as well. The illustrations are bright and vibrant and it contains good information on plants. We closed with Lenny in the Garden by Ken Wilson- Max. This is a nice story about a young boy Lenny, who is in the garden with his mom. While I like this book, I do think it is a bit young for the group I had today. I think if I were to use it again, I would use it for baby storytime. 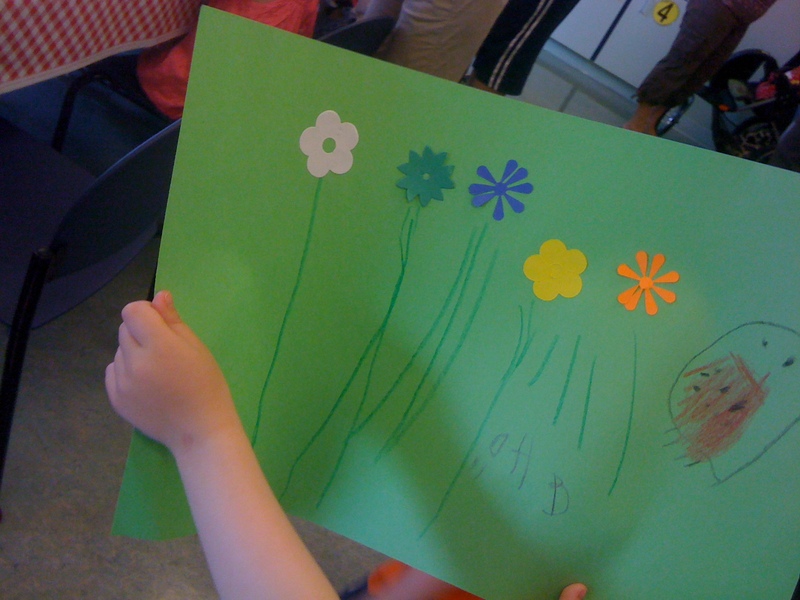 For our craft today, we made our own gardens! This was a super easy craft preparation wise. 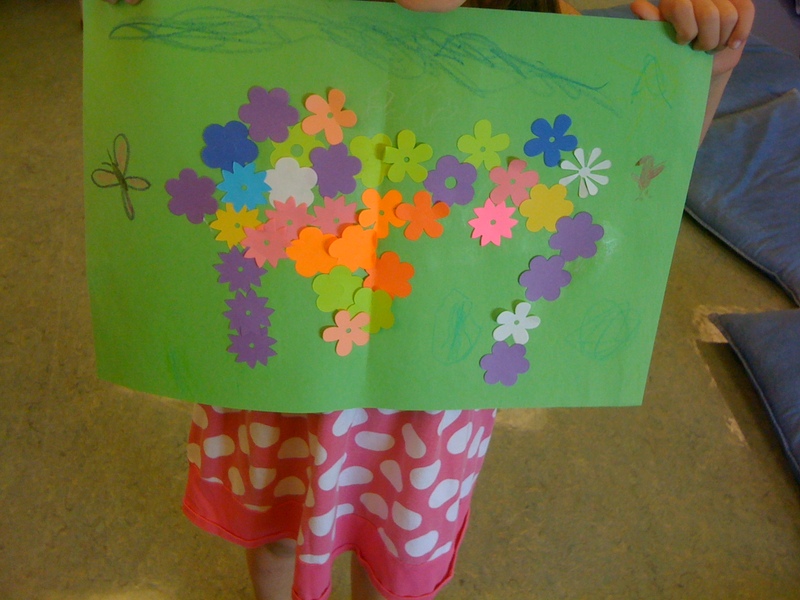 I made lots of flowers with our die cut machine, gave them glue, crayons and paper and let them go crazy. I should mention that my friend, storytime katie, recently did a garden theme as well. If you want more ideas, be sure to check out her blog! This week’s theme went through a lot of changes. Let me explain: I wanted to read Pig-Boy: A Trickster Tale from Hawai’i by Gerald Mc Dermott (I talked about it in a Storytime Contenders post post). I started out with a fable theme, but it just wasn’t working for me. Then I decided to do a Hawaii theme but it was a challenge to find enough books to fit this theme. Finally, I opened it up and settled on a Tropical theme. This just gave me more to work. I had to remind myself that themes are basically for myself. I know librarians who never use themes. Sometimes I don’t if I have a preschool visit suddenly pop-up or something. I have just found structuring a storytime around a theme to be a good way to focus the storytime for myself. I don’t always announce it to the children and I would be willing to bet some of them have no idea that there ever is a theme. So, we started with one of my favorite books set in the ocean I’m the Biggest Thing in the Ocean by Kevin Sherry. I think this book is hilarious. For the first time today in storytime, one of the children pointed out that the main character is boasting and “is not very nice.” Everyone was very excited to see what would happen to this boastful fellow. In the end, he is swallowed by a whale and proclaims the he is the biggest thing in this whale. Many of the children noticed that his is NOT, however, the biggest thing in the ocean. Next we read Hula Lullaby by Erin Eitter Kono. This is a very nice lullaby story with bits of flavor from Hawaii throughout. This is a nice book to calm everyone down a bit. We closed with Pig-Boy: A Trickster Tale from Hawai’i. Since this book was the reason for this storytime, I was super excited to share it with the group. I am pleased to report it was a success! It really held their attention and everyone was very interested in what happened to Pig-Boy. I love it when I share a book no one in the room has read before and everyone is so interested to see how the story ends. I am also very excited about today’s craft. We made leis! 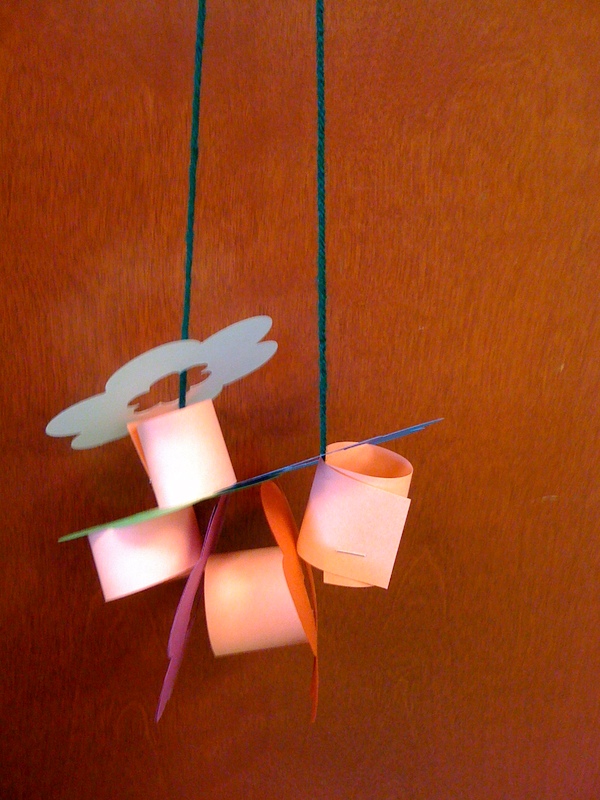 This is a very easy craft to make. 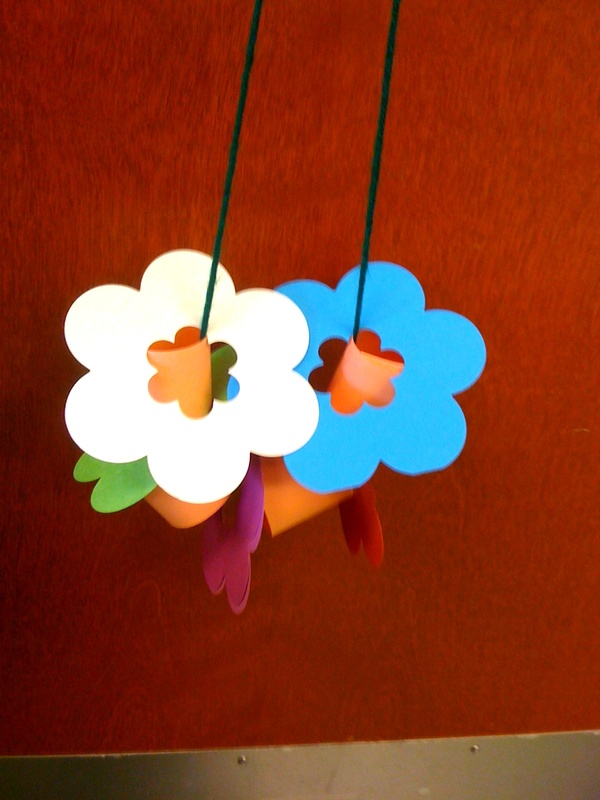 I cut out flower die cuts, and gave them yarn and some spacers I made out of cardstock. That was probably the most time-consuming part of the preparation. Oh! One more thing! There is a new Froggy book I would have loved to have included today but it is new and still on-order at my library and although I put it on hold, it didn’t come in on time. It’s called Froggy Goes To Hawaii by Jonathan London. 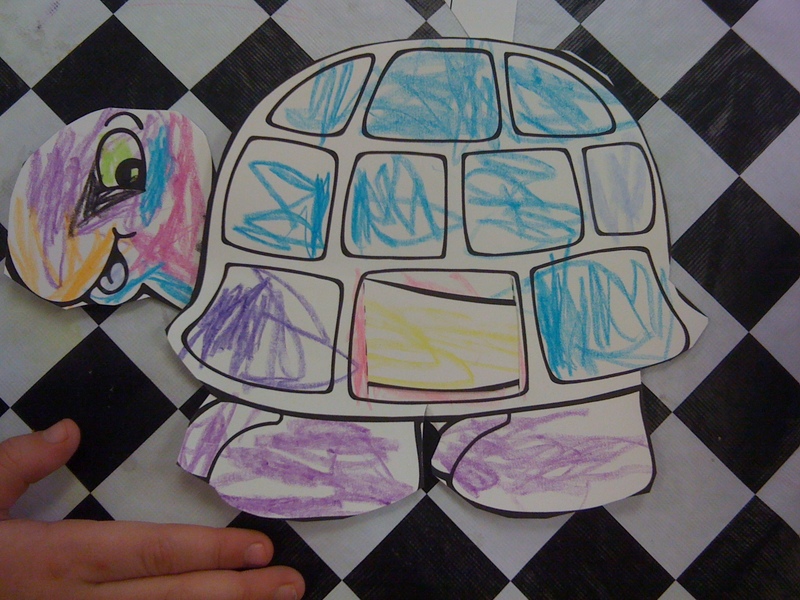 Today’s storytime theme was turtles! It was a fun theme and the group really enjoyed it. I can’t believe I haven’t done it before. I only have two books to share today because my group was very talkative and had lots of energy so we did extra movement activities to help them get their wiggles out! It’s been cold lately and I think everyone has a bit of cabin fever waiting for spring to come back. The first book we read is called Hurry Up and Slow Down and it is by Layn Marlow. This is a very sweet book about a tortoise and a hare. The hare is always in a hurry and wants the tortoise to “Hurry Up!” However, when it comes time for the tortoise to read the hare a story, the hare worries the tortoise is going much too fast and wants him to “Hurry Up and Slow Down!” It’s a nice book and many of my kids were familiar with the tortoise and the hare which added a bit of depth for them. 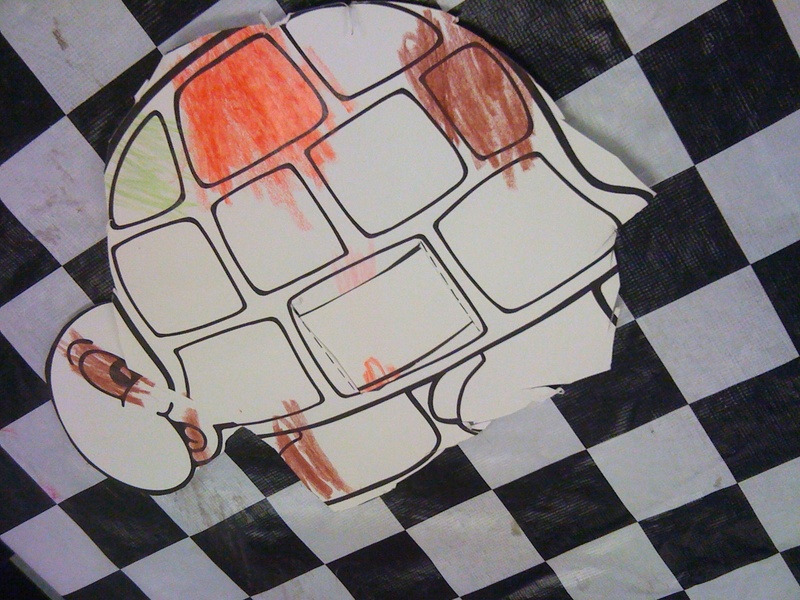 This is a counting book about turtles. It’s simple, but fun to read and it kept my group’s attention. We all counted together, which was a great way to keep them involved with the story. Falwall has another book that features turtles, Scoot! that is a great book for this theme. I didn’t get to it because I ran out of time and we spent much more time moving around this week than usual. Our craft today was really cute. It’s from this website. It’s a turtle whose head can peek out from its shell! Everyone really liked it and the children were quite proud of what they were able to make. This craft does require a bit of cutting, which worked great today because most of the children are confident with scissors and if they needed help their parents were there to provide it. Everyone’s storytime group is different so if your group isn’t ready for scissors, this craft might require some pre-cutting. 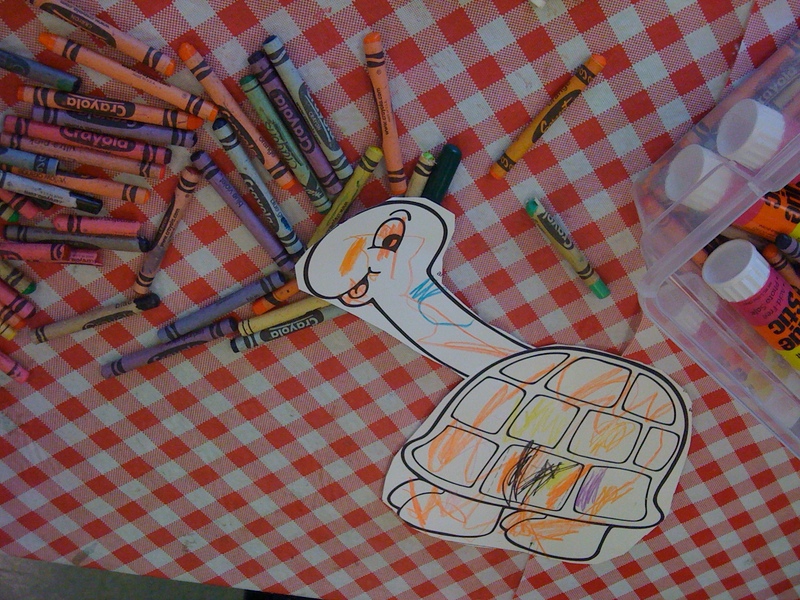 As usual, everyone’s turtle was spectacular!